It’s Fall already and we are taking inspiration from nature today. 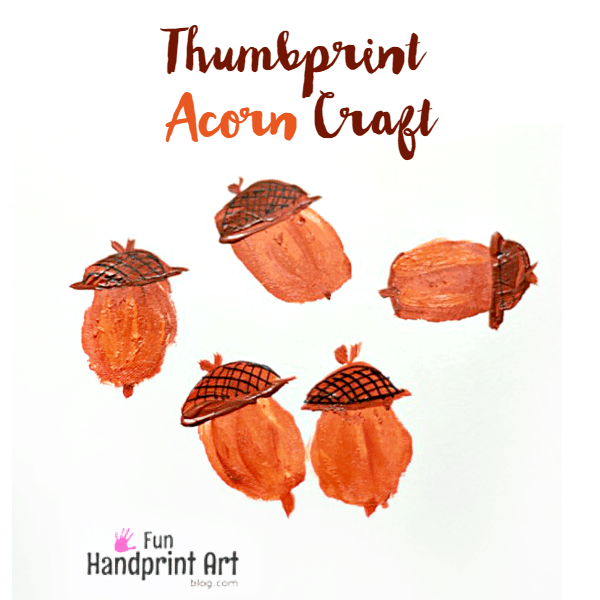 This adorable thumbprint acorn craft is fun to make and is easy enough for kids of any age to get involved in. Make a Thanksgiving card or use as placecards for your Thanksgiving dinner, both ways this fun craft will act as a reminder that the kids were little once. Orange & Brown acrylic color. You can choose brown and white too. 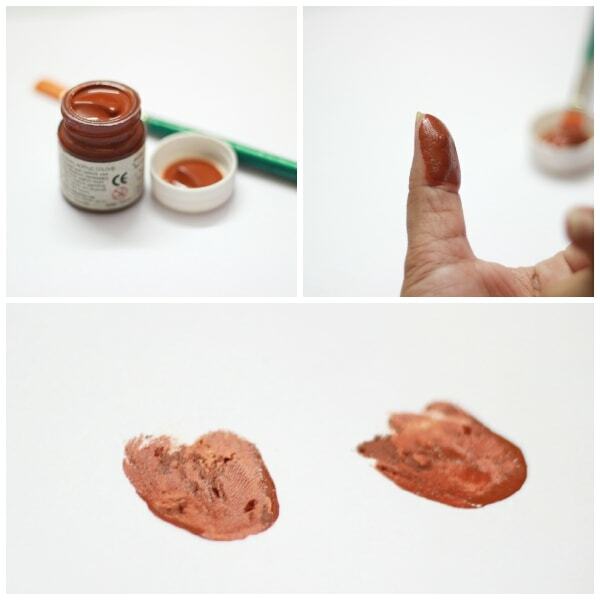 We used a flat brush to cover our thumb with a mix of brown & orange paint. Before the paint dried, we pressed our thumb onto a construction paper to make the thumbprint. We had to put 2 thumbprints to make one acorn. We had super fun making different sized acorns. Some sideways and some straight. Once the thumbprints dried completely, we used the flat brush again, and painted the Acorn caps in a ‘C’ stroke. My daughter is nine and so she could do this easily. If you have younger kids, you can draw a C-shaped acorn cap and ask your child to fill in with color. We painted two lines at the top and one line at the bottom. Again, you can use markers instead of a paint brush. Using the marker, add some criss cross strokes on the acorn cap for added effect. And your cute Thumbprint Acorn Craft is ready. To complete the picture, you can also add a Handprint Turkey & Fall Tree or this corn on the cob using block printing to the canvas. 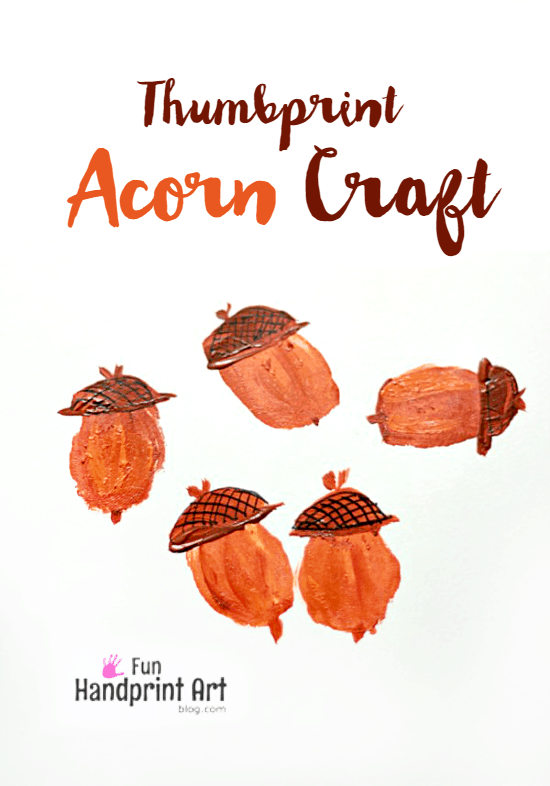 Did you love our super simple Fall thumbprint acorn craft? We would love for you to share the image above on Pinterest! Make a Footprint Turkey using Feathers! I love this idea! Pinning this one!